Amy Kiefer and Krystle Howald are Ho-Chunk sisters who believe two heads are better than one. 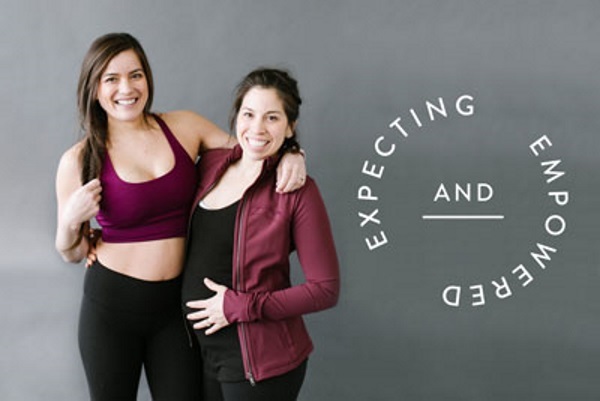 The business is based on their postpartum and pregnancy workout guides. The guides are available for sale on their website, Instagram, and they also have a Facebook page. Their regular daytime jobs are also in the healthcare field. Krystle owns and operates her own physical therapy business, “Empower Movement Physical Therapy,” in Oconomowoc while Amy is an oncology nurse at the UW Carbone Cancer Center in Madison. The idea came to Amy and when she suggested it to Krystle, she quickly agreed that there was a need for physical guidance when dealing with pregnancy. “We’re really close in age, 21 months apart,” Amy said. “So when I was pregnant with my first baby, I discovered that there were so many women around me going through pregnancy as well. I just saw what a difference it made to work out and do the right thing during pregnancy. I just felt lucky that I had the knowledge and experience. Krystle’s expertise in physical therapy has helped the sisters create the guides. “The other business I own is a physical therapy clinic, so we do a lot more hands-on work here, so patients come in for treatment. But it’s set up a little bit different than other physical therapy clinics. We don’t take any insurance so that allows us to spend a lot more time on treating patients more like a person, more like many body parts together. Sometimes insurance companies will allow you to work on certain parts, like only the shoulder, or only work on the hip, when really you should link those things together to get the person better,” Krystle said. The sisters were very close growing up and that relationship has continued to this day. “Amy and I grew up in Pewaukee, two of six children. My mom, Valerie Kempen, was adopted so we grew up with German grandparents and then my mom, when I was 8 or so, made all the connections back to the tribe. I found out who her actual parents were with the Ho-Chunk tribe and part Sioux. I also found an uncle who lives in Red Wing,” Krystle said. She became interested in the physical therapy field because her brother had a spinal cord injury when she was in middle school. Through that effort, she believed she was going to help rehabilitate spinal cord injury patients. She started the physical therapy business because she wanted to give patients more personal and comprehensive treatments than what was being offered. Amy was a personal trainer, but then changed professions to become an oncology nurse. She owes her love, and her sister’s love, for helping people to the development of the pregnancy workout guides. “’We both really enjoy people. And so, when you’re looking at a career in medicine, you really get a chance to support and connect with people. I honestly think that’s why we both started heading in that direction,” Amy said. When she had her baby, she saw that a lot of women weren’t doing the right things. Amy has two boys and one on the way. Max will be 3 this spring and Trey is a little more than 1 year old. Amy noticed that when she changed her workouts during pregnancy, her pains and discomfort were less. She had an easier pregnancy and her sister, Krystle, noticed the same thing because she was pregnant about the same time. “It was like magic. What solidified it is that we both used the workout guide with our second pregnancies; our second kids are really close in age, too. We saw the difference in our bodies when we followed this guide specifically and how good we both felt. We knew we had something,” Amy said. Krystle has three children: Brooke is 3, Avery is 1 ½, and Camden is 18 weeks. The guides also are for postpartum, meaning after the baby is born. “I use those exercise guides every day,” Krystle said. “I think it’s really important to use those things for yourself as a mom to keep your sanity. Those exercise guides are nice in that they are contributing to your health. It’s kind of nice taking a mental break from your kids during the day. You can do the exercises during their naptimes or during the morning or at night. It makes it very easy to do. “My sister (Amy) does it too. I haven’t missed any part of the guides, especially the postpartum guides. With my first kid, I didn’t have that. I had a lot of aches and pains during pregnancy and I actually thought that was pretty normal,” Krystle said. “But I actually thought I had an easy pregnancy. Compared to other ones using the guides, it was way easier because you’re kind of strength training, just like an NFL player would strength train for football,” she said. Their guides can be purchased on their “Expecting and Empowered” website. “We share so many tips. There are free tips for moms, expecting, or people looking to get pregnant. Also, active people who would like to get to know their bodies, but that is better done following our Instagram. We run most of our business off Instagram,” she said. “We’re strength training our mommy muscles, so a lot of upper back muscles and hip muscles. You’re doing various sports-specific stuff in the guides, so it makes it a lot less physically demanding because having children is a physical job,” Krystle said. Krystle and Amy believe developing the pregnancy workout guides came about because of their hard work ethic. They like to get things done.